What do you do when you have an over abundance of blueberries and blueberry pie filling? You make scones, that's what. 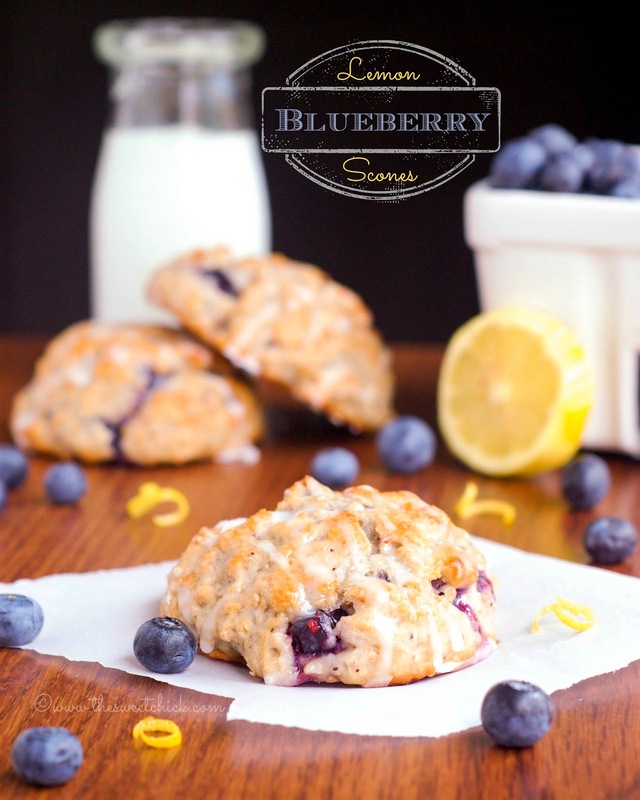 These moist, delicious scones have twice the blueberry impact with hints of lemon in the batter and in the glaze. I am a big fan of the blueberry/lemon combo ever since I made those Lemon Blueberry Basil Rice Krispie Treats a while back. Unfortunately, my basil plant has gone dead since then, otherwise I may have put some in these scones too. Perhaps next time. So one of my neighbors works for a food distributor and gave me a 116 oz. can of blueberry pie filling. Um, that's a lotta pies. So I have been diligently trying to use as much as possible. I made a Blueberry Yum Yum for the 4th of July. 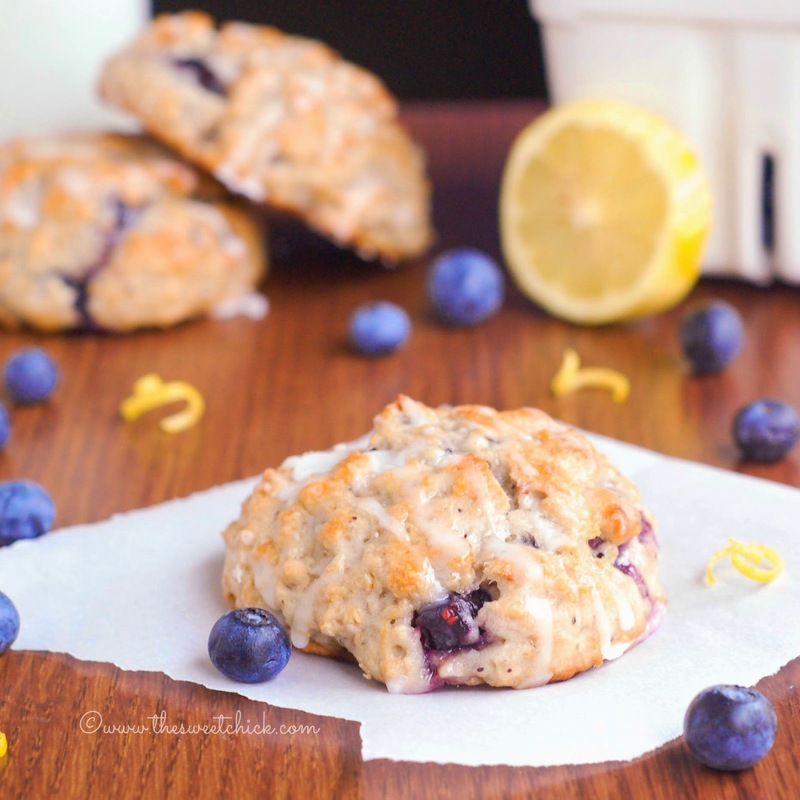 This week I made some blueberry muffins to take to Bunco night and these Lemon Blueberry Scones. It still didn't make a dent in the supply. So I ended up freezing the rest. I don't want all the neighbors getting sick of blueberries. 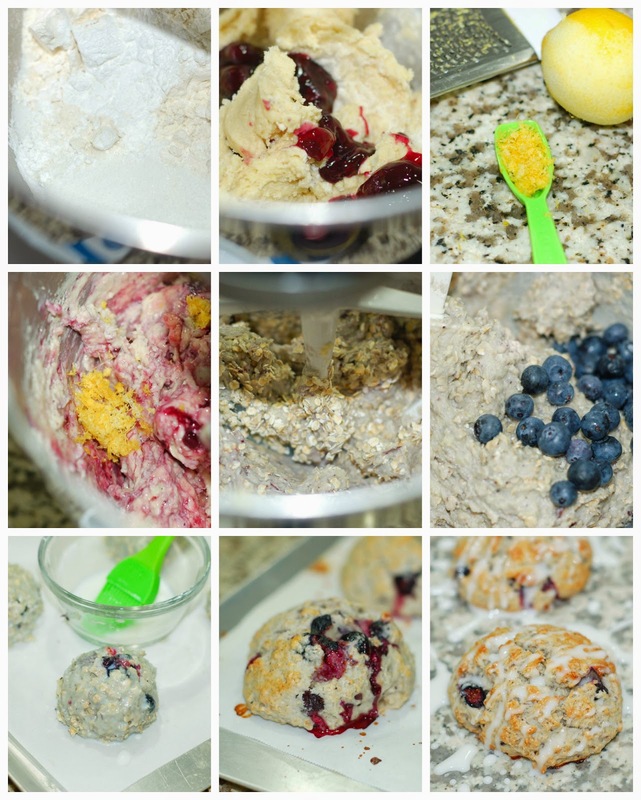 The blueberry pie filling gave the batter a slightly blueish tint, heightened the blueberry flavor, and made the scones nice and moist. I added a lemon extract to the glaze for a little more lemon flavor. The balance of flavors was perfect, blueberries with a hint of lemon. 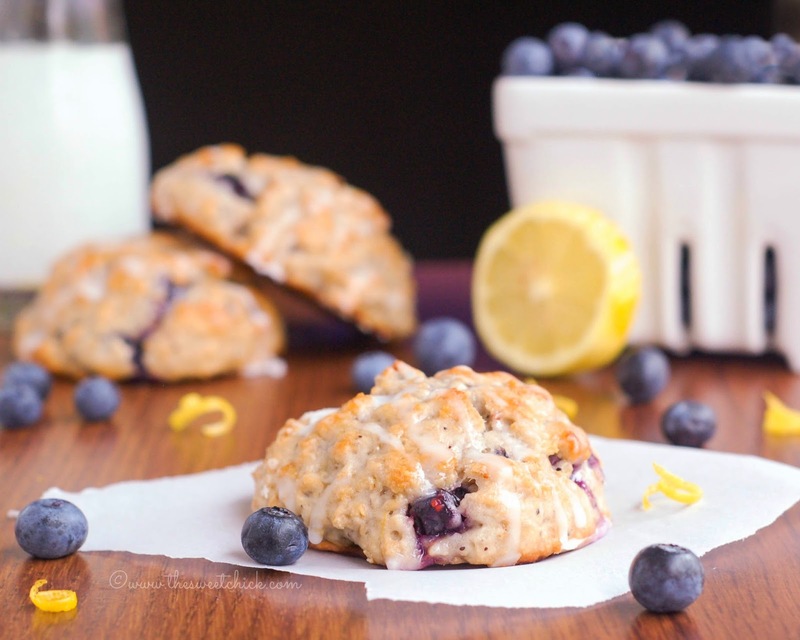 These Lemon Blueberry Scones are great as a snack, dessert, or to go with your morning coffee. Can't you see, these scones are calling out your name. Go on and make some today. In a small bowl mix egg and milk until blended and add to the flour mixture. Then add blueberry pie filling, lemon zest, and lemon juice and mix on low speed until fully incorporated. 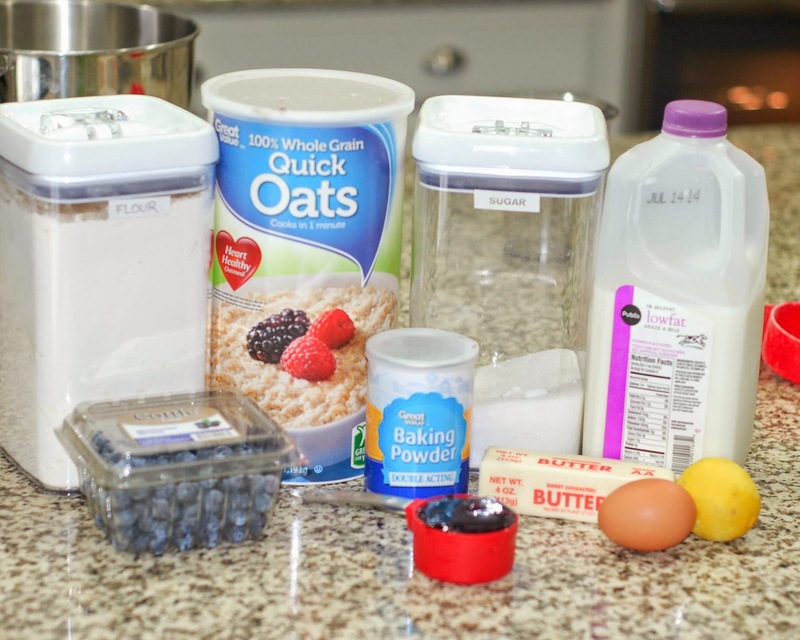 Next, add the quick oats to the mixture and mix well. The batter will be a dough like consistency. Lastly, add the blueberries in and mix by hand until evenly distributed. With a large scoop, place dough onto a greased cookie sheet. Do not flatten. Bake for 13-15 minutes or until toothpick inserted in middle comes out clean and tops are a golden color. In a small bowl whisk together powdered sugar, milk, and lemon extract until smooth. 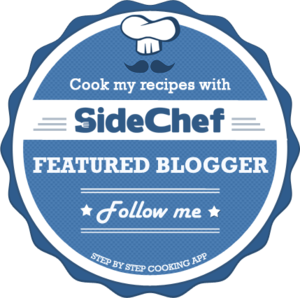 This recipe may be shared at these fabulous parties.